Here, a DirectoryIterator object is initialized with a directory name, and the object’s rewind() method is used to reset the internal pointer to the first entry in the directory. A while loop, which runs so long as a valid() entry exists, can then be used to iterate over the directory. Individual filenames are retrieved with the getFilename() method, while the isDot() method can be used to filter out the entries for the current (.) 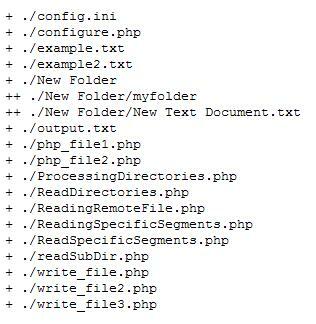 and parent (..) directories. The next() method moves the internal pointer forward to the next entry. Here, the opendir() function returns a pointer to the directory named in the function call. This pointer is then used by the readdir() function to iterate over the directory, returning a single entry each time it is invoked. It’s then easy to filter out the . and .. directories, and print the names of the remaining entries. Once done, the closedir() function closes the file pointer. Also consider PHP’s scandir() function, which accepts a directory name and returns an array containing a list of the files within that directory together with their sizes. It’s then easy to process this array with a foreach loop. The printDir() function in this listing might appear complex, but it’s actually quite simple. It accepts two arguments: the name of the top-level directory to use, and a “depth string,” which indicates, via indentation, the position of a particular file or directory in the hierarchy. Using this input, the function opens a pointer to the named directory and begins processing it with readdir(), printing the name of each directory or file found. In the event that a directory is found, the depth string is incremented by an additional character and the printDir() function is itself recursively called to process that subdirectory. 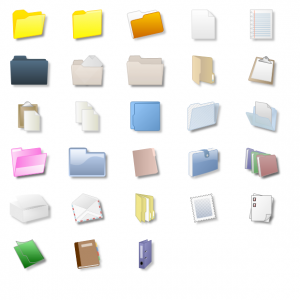 This process continues until no further files or directories remain to be processed. Figure 3 has an example of the output of this listing. copy, move, and delete files; and work with file paths and extensions. Table 6-1 lists some of the important functions in this category. It’s important to note that if the destination file already exists, the copy() function will overwrite it. As with copy(), if the destination file already exists, the rename() function will overwrite it. PHP will only allow you to copy, delete, rename, create, and otherwise manipulate a file or directory if the user “owning” the PHP script has the privileges necessary to perform the task. Here, the removeDir() function is a recursive function that accepts one input argument: the name of the top-level directory to remove. The function begins by creating a pointer to the directory with opendir() and then iterating over the directory’s contents with a while loop—you’ve seen this technique in a previous section of this chapter. For each directory entry found, the is_file() and is_dir() methods are used to determine if the entry is a file or a sub-directory; if the former, the unlink() function is used to delete the file and if the latter, the removeDir() function is called recursively to again process the subdirectory’s contents. This process continues until no files or subdirectories are left; at this point, the top-level directory is empty and can be removed with a quick rmdir(). I truly like your writing style, great info, appreciate it for posting : D.